This chocolate raspberry doughnut recipe is Paul's interpretation of the showstopper challenge in the Advanced Dough episode of Season 1 of The Great British Baking Show. It is explained in further detail by Paul in Season 1 Masterclass: Part 4. Put the flour into the bowl of a mixer fitted with a dough hook. Add the salt and sugar to one side of the bowl and the yeast to the other. Add the milk and eggs and mix on a slow speed for 2 minutes, then on a medium speed for a further 6 – 8 minutes, until you have a soft, glossy, elastic dough. Add the softened butter and continue to mix for a further 4 – 5 minutes, scraping down the bowl periodically to ensure that the butter is thoroughly incorporated. The dough will be very soft. Tip the dough into a plastic bowl, cover and chill overnight or for at least 7 hours, until it is firmed up and you are able to shape it. Divide the dough into 18 equal portions (approx. 30g each) and flatten each out slightly. Place a piece of chocolate or a raspberry in the center of each piece of dough. Gently fold the dough up and over the raspberry or square of chocolate and shape each portion into a ball. Place on a large baking tray in a plastic bag and leave to prove for 20 minutes. Preheat a deep fat fryer, filled with sunflower oil, to 340F. Lower the chocolate doughnuts carefully into the fryer, cooking each side for about 3 minutes, until golden brown. Remove from the fryer, drain on kitchen paper and leave to cool. Spoon the melted dark and melted white chocolate into two, small, disposable piping bags. 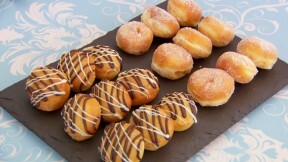 Snip off the ends and using the dark chocolate, pipe a zig zag pattern over each chocolate doughnut. Repeat with the white chocolate and leave to set.